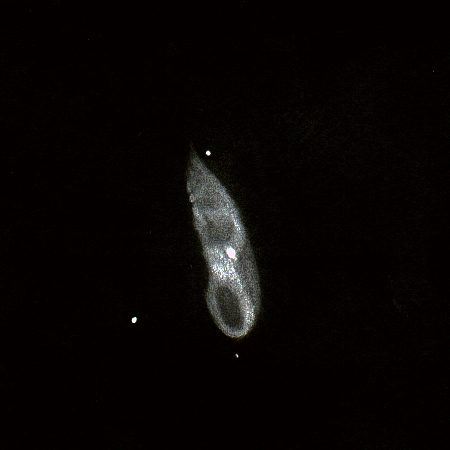 NGC 6207 in Hercules sketched by Andreas Domenico, Germany. Last month I wrote "Between the serpents" which took us from Draco to Hydra. This month's 2-hour-wide observing window is between R.A. 15:30 and 17:30, and again begins with galaxies in Draco, but finishes with globular clusters in the arms of Ophiuchus, the Serpent Bearer. We'll throw in some nice double stars along the way as well. NGC 5982 and NGC 5985 are two bright galaxies that share one field of view, located conveniently between the two bright stars that bend the serpent around the bowl of the Little Dipper. The stars are mag 3.3 Edasich and mag 4.0 Theta Draconis. Point your scope about 1/3rd the way from Edasich toward Theta, and nudge it north. Richard Navarrete's notes say "These were all in a line with 5985 the largest and brightest in the group. A very interesting field!" A third dimmer galaxy rounds out this famous trio ... one spiral, one elliptical and an edge-on ... set in a sweep of stars that parallel the galaxies from southeast to northwest. Beautiful sight. For a side trip follow the two prior locator stars toward Draco's head. They'll point toward the double star Nu Draconis, the northwestern star and dimmest of the four comprising Draco's head. The double Nu is a nice sight, but while here, move four degrees west to mag 5 Mu Draconis, another nice double. My own observation was a "gold pair that is very tight with a clean split at 100x. The components are equal brightness and lay N/S." Continue in the same direction four and one half degrees to another fine double star, 16 and 17 Draconis. I wrote "mag 5.6 visible naked eye. Nice white pair with 16 Draconis just 7' N. Pair is tight at about 1.5" with brighter star to the W."
NGC 6229 is a surprise in Hercules. It is hard to compete with M13 and M92 ... the two magnificent globular clusters in the constellation, so many observers are surprised to find this NGC globular hiding in the strongman's backwaters. NGC 6229 is a bright small globular cluster north of the keystone toward the Draco border. At 70x the globular is granular with some hint of individual stars. It is a nice view, as two equally bright stars, the brightest in the field, stand equidistant 8' west of the glob. Nice triangle. At 100x the granularity is more pronounced and the bright core diminishes evenly out to the edges. Seems to be about 1.5' diameter. 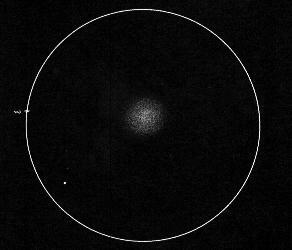 Speaking of M13, we can use it as the landmark for our next target, NGC 6207. Jay Reynolds Freeman notes "M13's better-known 'companion' is NGC 6207, about 20 arc minutes northeast; it is easy in a four-inch telescope in a dark sky." I like to view M13 and NGC 6207 in the same field and marvel at the relative distances. M13 is a mere tens-of-thousands of light years distant, then empty space out to the little galaxy ... forty six million light years further away. Now we are in the realm of the serpent bearer, Ophiuchus, where we'll visit four globular clusters. This is not surprising, as this constellation is the richest in globulars. NGC 6342 is a mag 10 globular at the southeastern end of Ophiuchus. Bruce Jensen wrote "NGC 6342, mag 9.9, came off as moderately-sized, fairly bright, pretty well resolved, with a well-condensed center, sort of a smaller version of M5." Find it four and one half degrees southeast of mag 2.4 Sabik. Seven and one half degrees west you'll find the unresolved globular NGC 6235. It is bright at mag 10.2 and is "framed in a right triangle of stars, is diffuse with uneven edges. At 210x, with the 6mm, got 7-8 brighter stars to resolve across the cluster. It's listed as 32.6 kly away" according to Jamie Dillon. Jamie continues with NGC 6287, just over two and one half degrees east. He says it "is closer, 29 kly, and very different, round, tight, condensed. Got sugary at 126x. Studied it a 210x; after a couple of minutes got plenty of resolution, more than 20 little stars across the face." We're nearing the end of our night out. Drop down to Antares. Have you ever tried to split this double? It is not a particularly tight double, but the magnitude difference between the primary and secondary is significant, and the little "green pea" as it is known can get lost in the glare of the primary component. You'll need steady seeing to split this. Now move your scope a half degree northwest to find NGC 6144, an often overlooked globular cluster almost in the shadow of M4 one degree to its west-southwest. Bruce Jensen said "NGC 6144 was large and somewhat faint due to its sparsity but nonetheless well-resolved at 72x, and NGC 6144 was bright and well-resolved on its edge." We'll finish with a nice double star and another globular, both in Ophiuchus. 36 Ophiuchi is described as a striking twin system, both golden yellow. Two degrees to the west-southwest sits NGC 6293, and it is a nice object to end with. At mags 8.2 and reasonably sized at 7.9', this ball of mag 16 stars is well resolved. Jamie enthusiastically writes "The beauty prize went to 6293, just east of M19. At 210x it showed a bright core with swirls in its halo." I'll finish this month by asking for feedback from those who regularly read this column (if there are any of you). What I think works best is to fit writing to the audience, and your suggestions can help make them more relevant. I am a deep sky observer, and have a large number of observations under my belt, so it is likely that what I write may not meet the needs of readers. My e-mail address is at the end of the article each month ... let me hear from you.